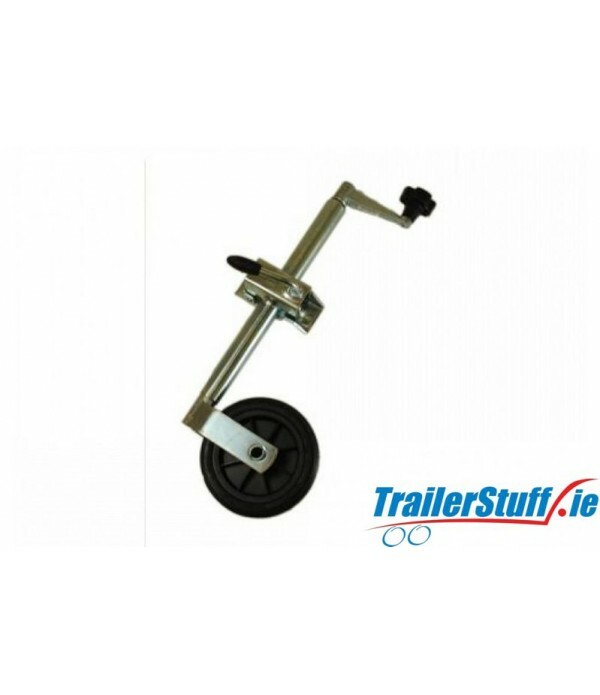 Jockey Wheels - Trailer Parts and Accessories | Ireland | Trailerstuff is Irelands largest online supplier of trailer parts and accessories. 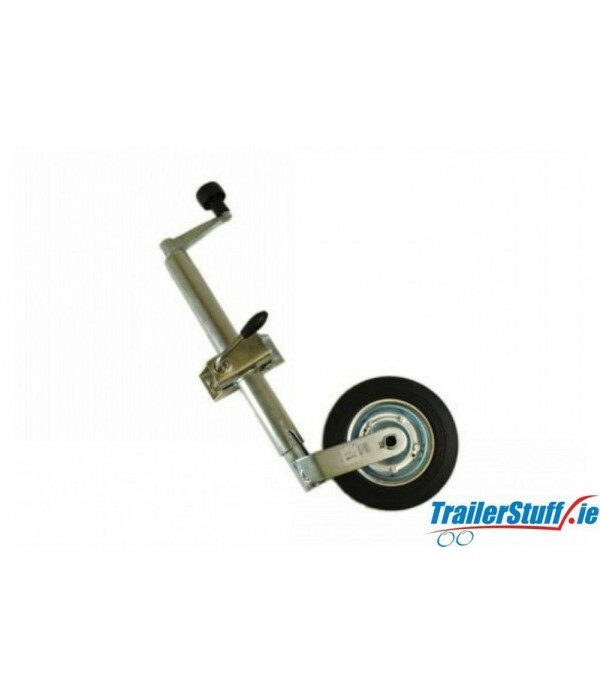 Description Constructed for standard duty applications, up to 75kg static nose weight, such as small leisure trailers 34mm outer tube diameter Height extension range 250mm Handle extension 110mm Tyre size 160x42mm Max static load with clamp 75kg Box / stillage qty : 4 / 250 Suppl.. 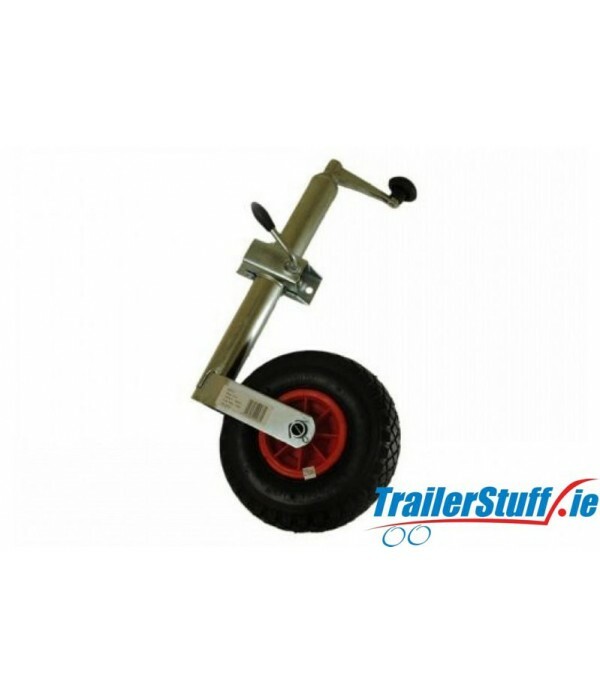 Description Constructed for heavy duty trailer applications up to 300kg static nose weight 48mm serrated outer tube diameter Height extension range 250mm Handle extension 85mm Tyre size 200x53mm. 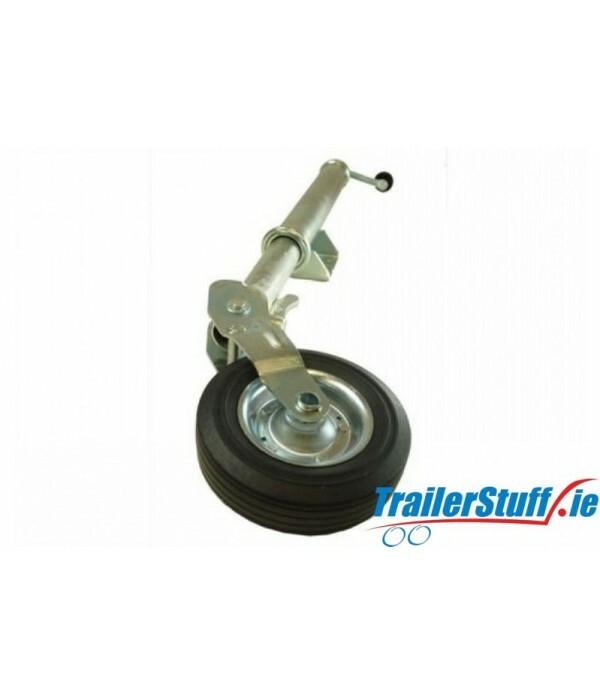 Large steel wheel with PU tyre, makes easy on most types of ground Max static l.. 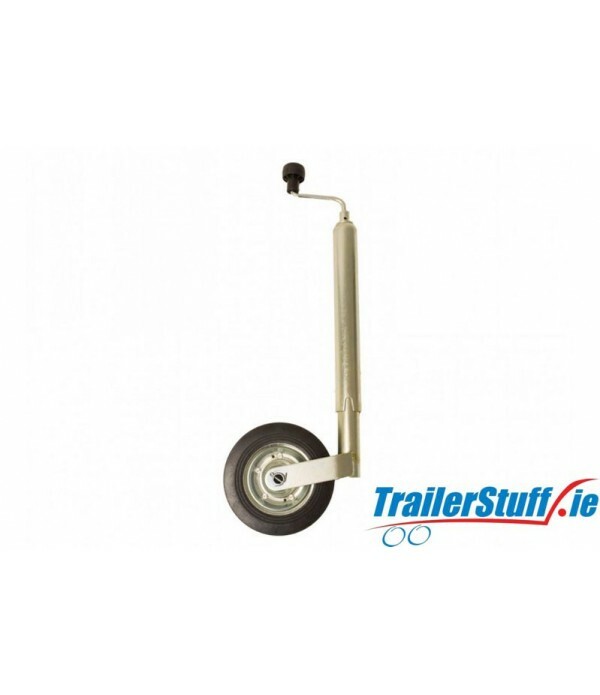 Description Constructed for standard duty applications, up to 100kg static nose weight, such as small leisure trailers 42mm outer tube diameter Height extension range 240mm Handle extension 106mm Tyre size 200x48mm Max static load with clamp 100kg Supplied with a clamp Cast steel..
48mm 150Kg telescopic jockey wheel no clampConstructed for medium duty trailer applications up to 150kg static nose weight48mm outer tube diameterHeight extension range 250mmHandle extension 105mmTyre size 200x48mmMax static load with clamp 150kgSupplied without a clampBall race handle bearing provi..
48mm serrated 750kg heavy duty jockey wheel suitable for professional trailer applications up to 750kg static nose weight48mm serrated outer tube diameter270mm height extension range, 130mm handle extension230 x 55mm tyre size750kg max static load capacityRugged and durable constructionErgonomic blu.. 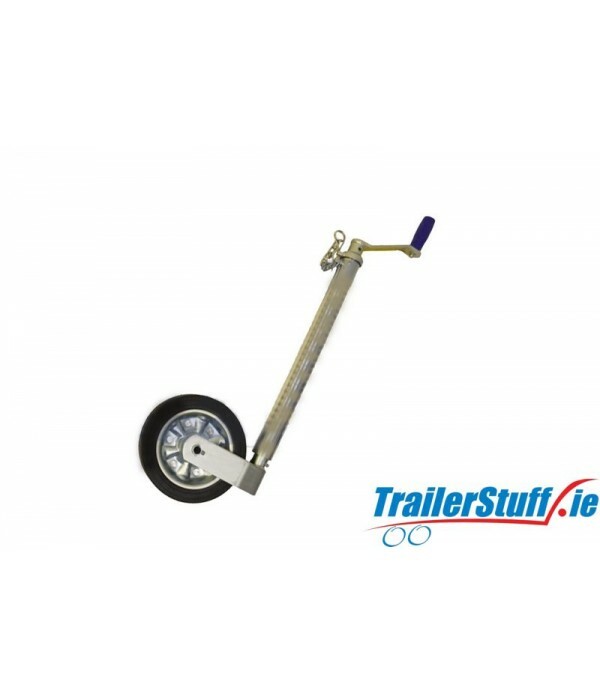 Constructed for use with caravans up to 100kg static nose weight 48mm outer tube diameter Height extension range 255mm Handle extension 85mm Tyre size 210x68mm Max static load with clamp 100kg Supplied without a clamp Short-reach wire handle gives unrestricted rotation close to the han..
48mm 400Kg jockey wheelConstructed for heavy duty trailer applications up to 400kg static nose weight48mm outer tube diameter to suit 48mm clampHeight extension range 240mmHandle extension 110mmTyre size 200x53mm. 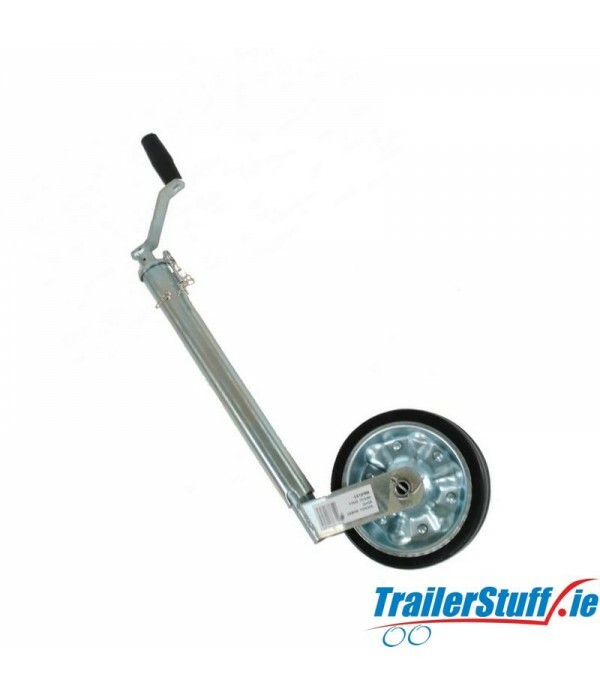 Large steel wheel with PU tyre, makes moving easy on most types of ground..
48mm. dia. 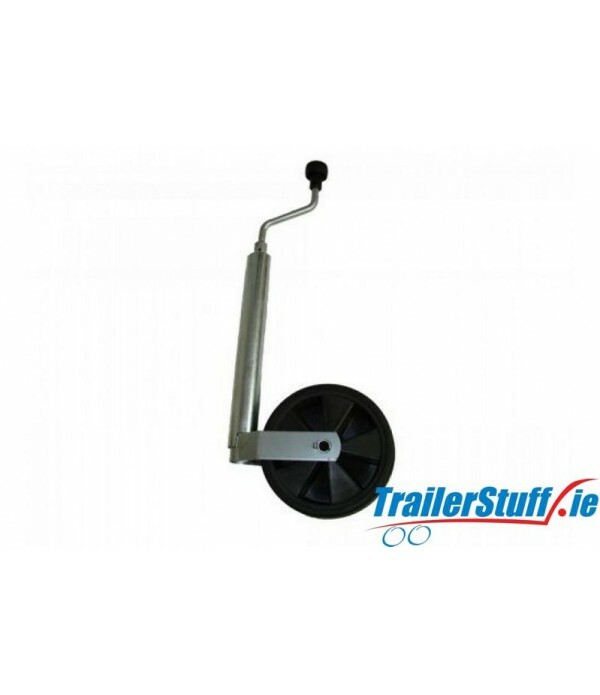 telescopic jockey wheel with PVC pneumatic wheel complete with clamp.. 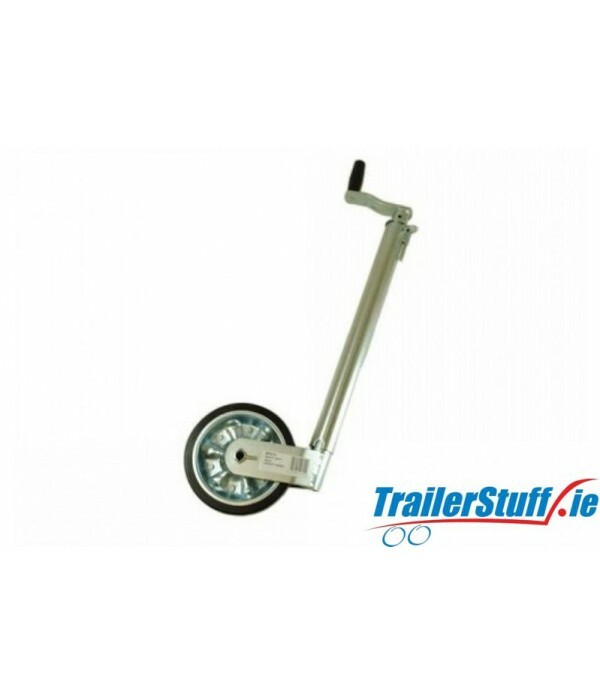 Description Constructed for heavy duty trailer applications up to 300kg static nose weight, for example car transporter, horse box, livestock, plant and twin axle trailers. 60mm outer tube diameter Height extension range 490mm Handle extension 130mm Tyre size 200x40mm. Max stat..